You want your patient to feel the benefits of the orthoses you prescribe and not to feel the orthoses in their shoes. Firefly strive to produce the most discrete custom made foot orthoses on the market. With this in mind, we are delighted to announce our latest shell material, DELRIN®. DELRIN® is a crystalline plastic engineered for strength, stiffness and wear resistance comparable to industrial metals. The material is employed across multiple industries, including high load mechanical applications, such as gears, door systems, conveyor belts and health care delivery devices. The material combines low friction and high wear resistance which has seen it replace metals in many industrial scenarios in temperatures ranging from -40•C to 120•C. But what does this mean for foot orthoses? As regards orthotic thickness, roughly half as much DELRIN® is required as that of a standard Polypropylene shell. Therefore, 2.5mm DELRIN® = 5mm Polypropylene to create the same level of support and can still be heat adjusted in the manner of a standard Polypropylene shell. It is suitable for fabricating low-profile dress orthotics and orthoses for obese patients, and its compact density and high tensile strength facilitate ultra-thin orthotic production for any patient. A thin 2-mm composite shell can support over 200lbs and control ranges from semi-flexible to very rigid. If you want a 50% Medial Flange the actual arch height and the Medial Flange together cannot be above 22mm. The higher the arch height is the higher the flange will go. Good wear and abrasion properties. 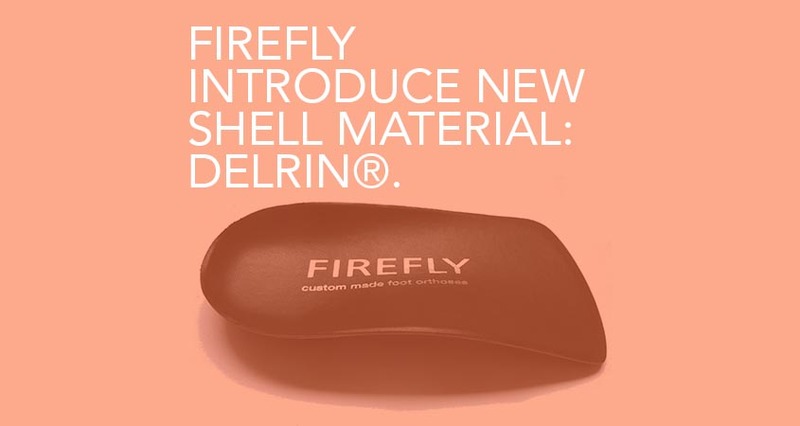 If you wish to find out more about using DELRIN® as a shell material in your Firefly prescriptions, contact us via email via email or telephone 00353 71 91 49494.